Australia's biggest bank has admitted it was late to disclose more than 53,000 transactions that allegedly breached anti-money laundering laws. 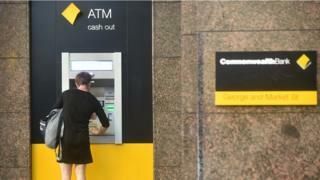 In August, the nation's financial intelligence agency launched court action against the Commonwealth Bank over claims it had failed to refer the transactions, made through smart ATMs. On Wednesday, the bank acknowledged some failures. However, it denied 102 claims relating to its reporting and due diligence. The bank argued its failures on 53,506 transactions "resulted from the same systems-related error", and should not be treated separately. It also acknowledged it had failed to meet risk assessment standards for its intelligent deposit machines (IDMs). The bank could face multi-million dollar penalties under laws designed to prevent money laundering and terrorism financing. Last month, the Australian government announced a royal commission inquiry into the country's banking and financial sector. The Australian Transactions Reports and Analysis Centre (Austrac) has accused the bank of failing to disclose 53,506 cash transactions that exceeded a A$10,000 (£5,700; $7,600) limit. The transactions were made through IDMs between November 2012 and September 2015. The machines were allegedly used by criminal syndicates to launder money, because they allow anonymous cash deposits. Bank chiefs have attributed the oversight to a coding error and said the bank was unaware of the breaches until 2015.